Buying a Car with a Credit Card - Can You Do It? Buying a Car with a Credit Card – Can You Do It? You have the cash on hand to buy a car, but use a credit card anyway. 1. Get out a loan and make monthly payments. 2. Buy the car outright in cash. I didn’t really want to have monthly payments anymore, especially since I had the cash on hand to pay for the car in full. But instead of whipping out a roll of hundreds to pay for the car, I asked if I could pay with my credit card, which has more than enough open credit to pay for such a purchase… and they said yes. So pay with the card I did. That purchase earned me over 18,000 reward points. Since it only takes 35,000 points to get a free ride (with private bedroom) across the entire country on Amtrak, this single purchase got me another 1/2 of a ticket, at no cost to me. As soon as the charge showed up on my credit card, I transferred the money from my ING account, and paid off the bill with cash. This idea is similar to what Jim at Bargaineering talks about in terms of buying coin money with a reward card to get the points, but on a little bit bigger scale. Not all car dealers/dealerships will let you do it, but I know someone else close to me who also bought their car this way, so it most definitely can be done. So if you have the cash to back up your purchase, I say most definitely buy your next car with a credit card if you are able. If you don’t have the cash on hand, I would avoid, at all cost, buying a card on a credit card. There are too many variables in play when you do that, and your payments and/or interest rate can change at any time. 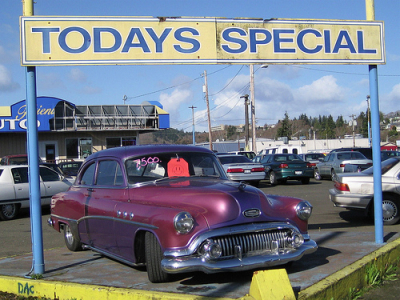 How To Pay Your Price On Your Next New Car Purchase – Part One. I’m with you on doing this if you have the cash on hand to pay it off – let’s hear it for cc rewards!!! While we were not allowed to purchase our cars this way (the dealer was all about NOT paying his cc fee on our purchase), we did buy an $8K motorcycle and a $3K motorcycle this way in the past few years, under the same basic concept – we have the money to buy them straight out, so let’s earn some rewards in the process. Good on you! Our dealership only let us put $10,000 on the card. It threw off our pie charts from the bank- but the miles were worth it! Great concept–if you have that kind of cash. It also speaks more to the argument to save up completely for your new car before you buy it! Wouldn’t this mess with your credit score and show a huge highest balance on your account? Not if it gets paid off right away. Great job getting those reward points! I love to use my credit card, especially on large purchases (if I have to make them anyway), but we always pay it off before the end of the grace period. Recognize that the dealer paid a cc fee, so they may have been willing to accept the card because they were making a healthy enough profit on the sale. One could argue that negotiating better could have reduced the price of the car more by paying cash than the amount you earned in rewards. If they were willing to “give the money back” on the cc fee, they probably would have been willing to give it back on the price if the car. Thanks Eli. I have the cash on hand and have been researching this topic to see if there are dealers that are willing to let you use the credit card. You are right on the fact that if they do, it is because they are already making the 3% fee in profit. This is something to definitely keep in mind when negotiating the price and the decision to use the credit card for points instead of getting a healthy cash discount. THANKS! I talked my car dealer into letting me put $10,000 after quite a bit of back & forther. But here’s a tip: Have the credit card customer service department on the phone with you before your cc is run through. I had contacted Capital One several times to give them advance warning – the last a phone call 2 days prior. They just waved me off with a “that’s no problem.” Then Capital One still declined the purchase 3 times until I got a Capital One manager on the phone. Embarrassing! In case you guys didn’t know.The car dealer is responsible for paying the cc fee.By law,they can not charge the coustomer for the fee.That is the contract between the dealers and cc companys. (Fact) My friend runs a dealership and told me this today.So watch out for the way they type in the sales reciept.If you look for a cc fee,you will not see it on there.They add it into the price so you will have to pay for it.The Damn cheap asses. I have a family member that bought a van with a credit card. Financing a credit card that way saved my relative a lot of money. My family member had a low interest credit card and had good credit and always paid their bills on time. From what I understand that credit card debt was paid off in less than 2 years because of the large monthly payments that was made.